Music for Ballet Class, Vol 2 contains 30 new tracks for barre and centre work with orchestrated pieces suitable for all ages and levels. 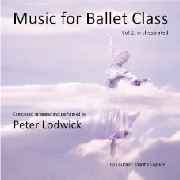 Peter Lodwicks motivation in creating this orchestrated CD, is to add an extra dimension to a ballet class and thereby enhance and inspire musicality and artistic quality. Breath, dynamics and variation has been essential in the creation prosess. "Wherever I teach a ballet class, when using recorded music, Peter Lodwick’s CD’s are a great success, either for international professional companies or academies and universities. His music does not only serve as a tool of rhythm but as an inspiration to reach qualities in the interpretation of dance."